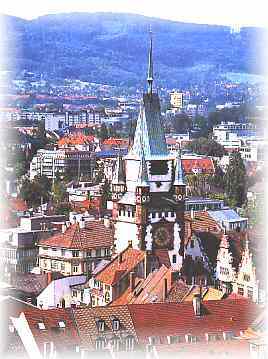 Find out, why Freiburg is different! Admire the view of the town from the heights of the Schlossberg. Be impressed by the sight of medieval buildings set against a backdrop of beautyful countryside. A rendezvous for art lovers: Freiburg shows many significant collections that will please the eye and feed the mind. Historic buildings from ducal and imperial times. Masterpieces small and large, past and present. Art and architecture in all their infinite variety. A rendezvous for culture vultures, Freiburg really is a theatrical place. Apart from the wide-ranging repertoire of the "Town Theatre" and many other smaller venues, you will find all sorts of buskers and street cabarets - traditional and modern - on every corner! Meeting-point Münsterplatz! The square pulsates with life even in the morning. And, with its exotic range of local produce, the market is a colourful attraction in itself. Plus the unforgettable fragrance of flowers, spices and "Bratwurst"! Wine connoisseurs will love Freiburg! For the wine from this region, blessed by sun, is simply superb. Numerous winetastings, wine taverns and restaurants will entice you to a while away the time...contentedly. A rendezvous for fitness! Prescribe yourself some health and recreation. The medicinal springs, invigorating hill walks, magnificent scenery and modern sport centres will soon get you going! Feel the "joie de vivre" wherever you go, the flair of the Mediterrean in Germany. Switch off and relax in the wonderfully mild climate - in the midst of babbling brooks and cheerful people.